We have all woken up with shoulder pain from time to time, and I am sure you’ll bet it is not the best feeling in the world. The stiff neck and the irritating muscles in the morning are not something you would like to experience again. You might even find it to be quite a struggle to stay comfortable and in general get some sleep at night. People will often joke about it and say they slept on the wrong side of the bed, but the real issue here is your pillow. Sleeping on the wrong pillow will have that effect on you. Therefore in this article, we are going to look at the best pillow for shoulder pain in the market this year. Having a good pillow impacts the quality of your sleep. Not only does it affect sleep but also your general health and recharge when sleeping. Therefore choosing one that is right for you wisely is imperative. Moreover, sleeping on a bad pillow will worsen your issues of neck pain, headaches or even allergies. Note that a bad pillow will not cause any of these problems but will only enhance these problems, and you can kiss your good night sleep goodbye. The quality is, of course, a critical factor that directly correlates to the type of sleep you get. Ensure that the pillow you get is of high quality and you won’t have to worry about having shoulder, neck or even back pain. The only thing is that they are slightly expensive so don’t be afraid to spend money since it is worth it. It is important to consider the firmness of your pillow because of the side you sleep. Whether you are a side, back or stomach sleeper, it is wise to know your level of firmness. For those who sleep on their back and side, a firm pillow would be an excellent choice while for those who sleep on their stomach a softer pillow is a good option. The material of the pillow plays a very significant role in providing support for your head, neck, and shoulder. Memory foam material is a suitable type since it conforms to your body well. It has been proven that using water based or memory foam pillow are good since they distribute your body weight as you turn at night. While this fact may not directly affect your shoulder pain issue, it is wise to consider the health benefits you get from it. The pillows we buy are meant to last long term, and ease of cleaning should be a key factor. Your pillow should have an easily removable and washable case. The inside of the pillow should either be machine washable or even easy to clean with a damp cloth. This kind of pillow consists of filling material called memory foam. It is made such that it conforms to your body and creates a ‘memory' of how you were sleeping such that when you turn it remains the same. You can count on it to provide support for your neck, head, and shoulder and the pain will be no more with this type of pillow. This pillow is relatively cheaper than the memory foam type. It has fiber filling material on the inside. The water bag supports the mesh on the inside that one can fill with water. The best part about this pillow is that you are the one who controls the firmness by adjusting the amount of water that you put into it. This type of pillow is made to provide support for your neck and shoulders since it conforms to your body. You can also count on the material since they are made to be resistant to mold, dust, and bacteria in general. This type of pillow consists of soft feathery stuffing that is easily movable and will provide support for you when you need it. The pillow is good since it provides support yet it is soft at the same time. Regardless or whichever your choice is, you can check out this video to help you know how to select the proper pillow for your shoulder pain issue. 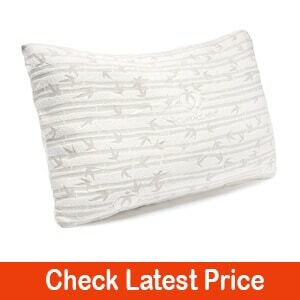 This pillow sold by P.U Products is 21.5” * 13” and has the inner material made from memory foam. The two pack pillow allows for your muscles to relax and therefore relieves your neck pain and shoulder pain. As mentioned earlier, memory foam material used for pillows provides for proper spinal cord alignment, and you can get the good sleep when you get in bed after a long day. Also, the material allows for minimum movement hence when sleeping with someone who is tossing all night; you won’t be disturbed. If you consider the ease of cleaning as a factor, this pillow comes with an easy to clean removable bamboo case. Therefore you don’t need to be worried about health issues such as accumulation of dirt that causes allergies to you. With this pillow, you will have a 5-year warranty. Therefore if there are any issues with it, you can easily return it, and your problem will be no more. You can also be sure that with this pillow, it will stay firm over a longer period unlike the shredded memory foam or the feather pillows. This pillow sold by P.U Products is 21.5” * 13” and has the inner material made from memory foam. The two pack pillow allows for your muscles to relax and therefore relieves your neck and shoulder pain. As mentioned earlier, memory foam material used for pillows provides for proper spinal cord alignment, and you can get the good sleep when you get in bed after a long day. Also, the material allows for minimum movement hence when sleeping with someone who is tossing all night; you won't be disturbed. This product sold by AtoZ Shop comes in different sizes. It is put to use by placing it under the neck and not under your head. It is best to determine your body type before buying one of these pillows since it is suitable depending on your body type. If you have a bigger neck, select one that is about 5.5-5.9 cm. If your neck is smaller, then 6-6.5 cm is what is best for you. You can easily choose one that is suitable for your neck that will ease your shoulder pain and place a towel underneath if you feel like it is too low for you. 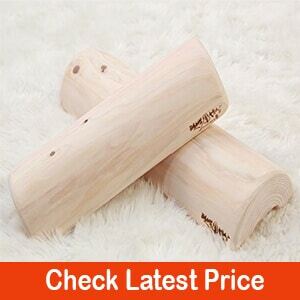 Is the best pillow when it comes to relaxing your body from any form of neck or shoulder pain. It offers a therapeutic feel to it as you use it. It also emits the smell of Phytoncide while using it which is either right or wrong depending on the user. This uniquely designed pillow comes in a size of 26.0” *13.4” *4” and the shape of butterfly wings. It is suitable for all sleeping postures whether you are a back, stomach or side sleeper. You can count on this pillow to relieve your shoulder pain and wake up with a big smile in the morning. The butterfly wings curves can provide for proper support and good alignment of your body therefore not only is your shoulder pain catered to but also snoring and turning at night. Another impressive feature about this pillow is the way in which it allows for air to flow through due to the presence of 16 holes that allows for proper ventilation. The pillow will not have cases of mold growth. It is also hypoallergenic therefore you can kiss you dust, mite, and bacteria worries goodbye. You won’t have to worry about your health because of allergic reactions to either of these allergens. 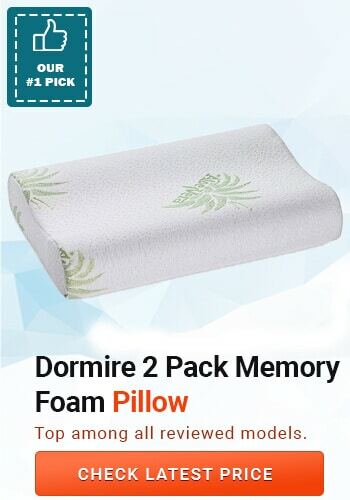 This pillow is also of high quality, and the memory foam maintains its shape for a longer period. 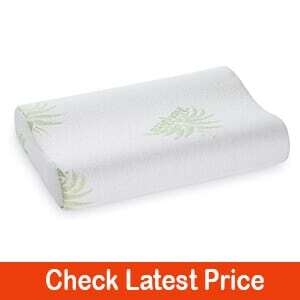 It is unlike the feathers or the shredded memory foam pillows that require adjustment now and then to keep them firm. It comes with two outer covers suitable for both summer and winter. This product sold by Bluewave Bedding comes in a size of 2.5 inches and is ultra-thin. This pillow is suitable for those who are back or stomach sleepers. It is made such that it has two surfaces one that is round and the other that is flat. 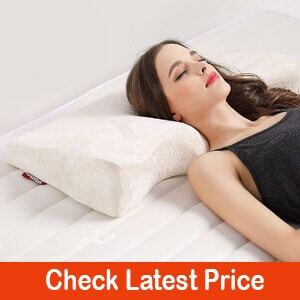 The most significant part about this pillow is that it provides proper alignment for the spine and you can be sure to wake up with no shoulder pain. You will wake up feeling well rested, and your attitude will be equally as positive. Another impressive feature of this pillow is that it has cooling gel and you can have a good night sleep without the problem of sweating. The gel will dissipate the heat at night and will keep you cool all night long. In addition to the cooling gel, this pillow comes with a removable bamboo cover that is easily washable. The cover takes away moisture and helps to keep you cool at night too. You can also count on the bamboo to take care of the smell since it naturally resists odor. The foam used for this pillow is CertiPUR-US certified, and it uses a material with low emissions of gasses that may deplete the ozone layer and also no lead or mercury which are poisonous. This pillow sold by TheComfortZone comes in both King size and Queen. The filling material is shredded memory foam. Using shredded foam means that you can easily adjust the firmness of your pillow whenever you want to. It also comes with a 40% bamboo case that uses a zipper for closing. The Bamboo, as mentioned in the previous pillow, is suitable material as it can wick moisture away from your body and you can be sure to have a cool night. This pillow can give you a good night sleep, and you can wake up feeling rejuvenated and ready for the day. The shredded 100% memory foam can provide support to your head and neck, and you can be sure of a pain-free shoulder day ahead. Another interesting feature about this pillow is that it is hypoallergenic and you can be sure of dust, bacteria, and mite free night. Other than the pain, your health should always come first, and that is what this pillow assures. The material used for this pillow is super soft and full of luxury while being breathable at the same time. The bamboo cover and the proper ventilation of the pillow will give you a stress-free night. Our obvious winner of this contest is the Bemo Contoured Memory Foam Pillow because of its many qualities. 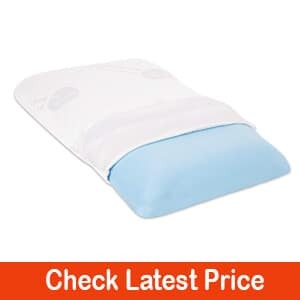 It caters to all the qualities you are to check when it comes to a pillow to relieve shoulder pain, which are good quality, a suitable material, provides adequate firmness and is affordable too. Therefore try to get yourself an excellent pillow since getting a good night means an even better day. I hope that you can quickly pick out a pillow to ease your shoulder pain. Do you have any questions or feel like sharing your thoughts with us? Hit us up in the comment section below.